Put a Bird on it? Sure. 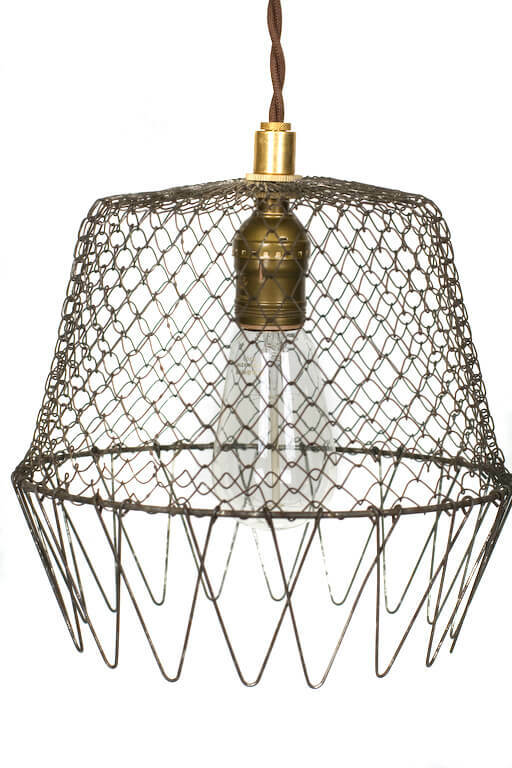 But let’s throw a big net over another design mega trend today — one with classic vintage-upcycling roots: Put A Bulb In It. A two-day miniseries. 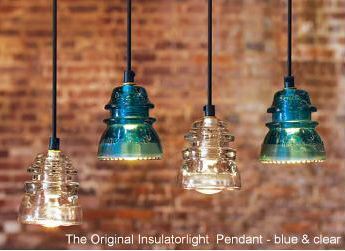 Today: 24 pendant lights made by repurposing and upcycling vintage treasures, which you can buy online. Tomorrow: A video featuring lighting expert Susan Schneider of Shandells.com, who shows me how we can fashion upcycled and artful pendant lights on our own. So let’s get going! 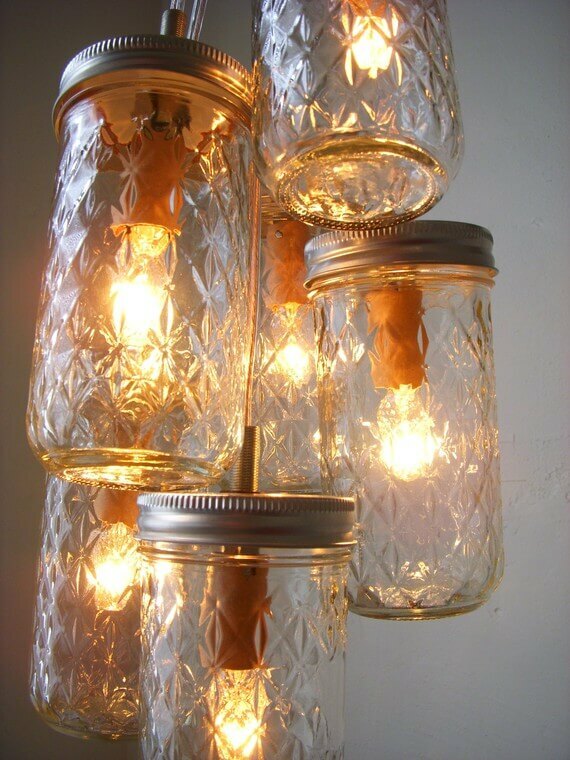 Above: The humble Ball Jar pendant light, which seems to have started this entire megatrend. 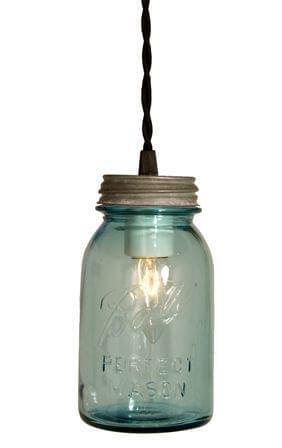 The Ball Jar pendant, above, is from Barnlight Electric $149. Disclosure: Barnlight Electric is a current advertiser, but this feature isn’t a part of deal or anything. The reason I like this light, in particular, is because it features an authentic vintage Ball Jar (which I think is important.) Readers, as you are looking through all of these lights shown, please remember that you often do get what you pay for — such as porcelain sockets, cloth-covered cords — good solid lighting. 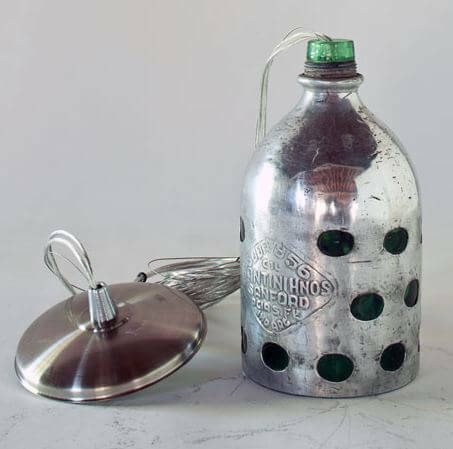 Poke around at Barnlight Electric some more,and you see these vintage acetylene tank tops repurposed into lighting, $149. They even have them in orange. 🙂 Note: Barnlight Electric is having a 10% off storewide sale right now – enter Spring11 on checkout. These are sa-weet! 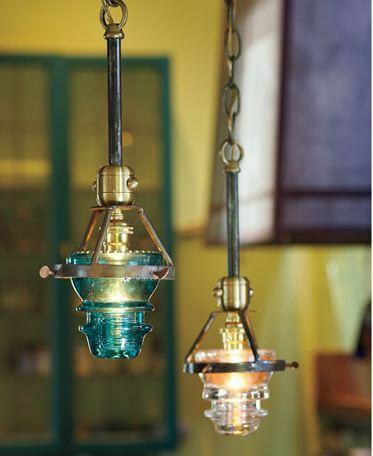 Pendant lighting made from old railroad insulators. Back in the late 60s and early 70s, we used these as planters — we flipped them the other way, strung them in macrame, and added spider plants. What a flash from my past! 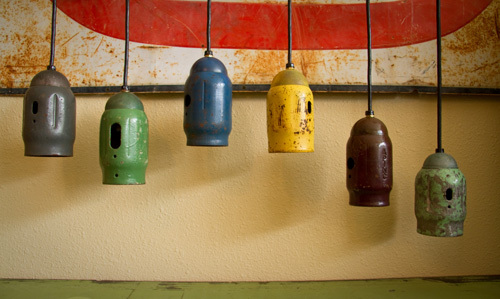 Vintage railroad insulator pendants from RailroadWare, $149. Also available via Remodelista, where I first saw them. Antique Key Plate pendant, from Napa Style, $599 (more styles available). Love the colors and the keyholes! 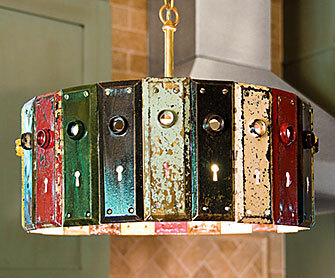 Here is another take on the insulator pendant, from Napa Style, $299. Are you having fun yet? 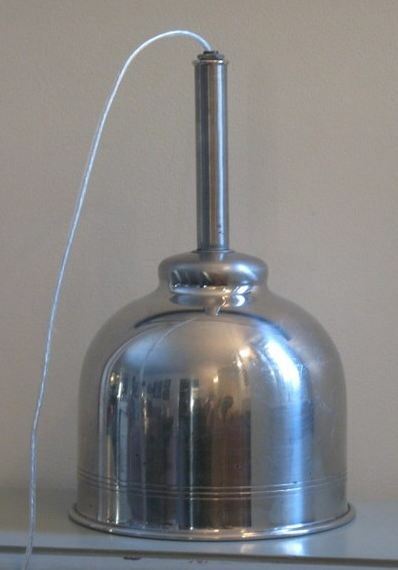 This one might be my favorite so far, because I fed my share of chickens growing up: Pendant light made from a vintage chicken feeder, from Napa Style, $399. That’s some chicken scratch! That Napa Style likes their upcycled, repurposed vintage, that’s for sure. Add some baubles and a pendant can easily become a chandelier. (Though, I have left “chandeliers made from upcycled vintage treasures for another day.) 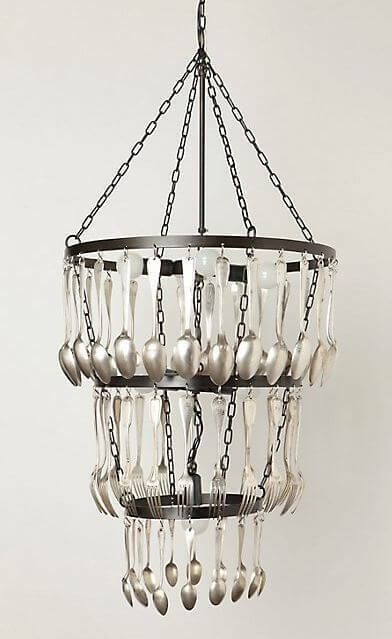 This Eat Drink Be Merry Chandelier by Jose Esteves for Anthropologie turns vintage spoons and forks into a $4,800 work of art. 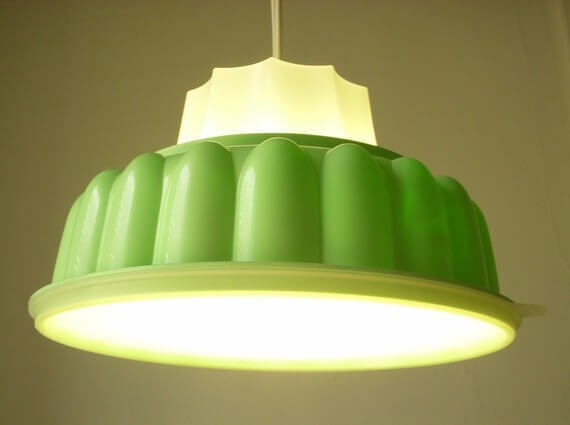 Heading over the etsy.com, which I suspect will be a bonanza, I immediately am presented with this pendant light made from a vintage jello mold, just $35, from BootsNGus. 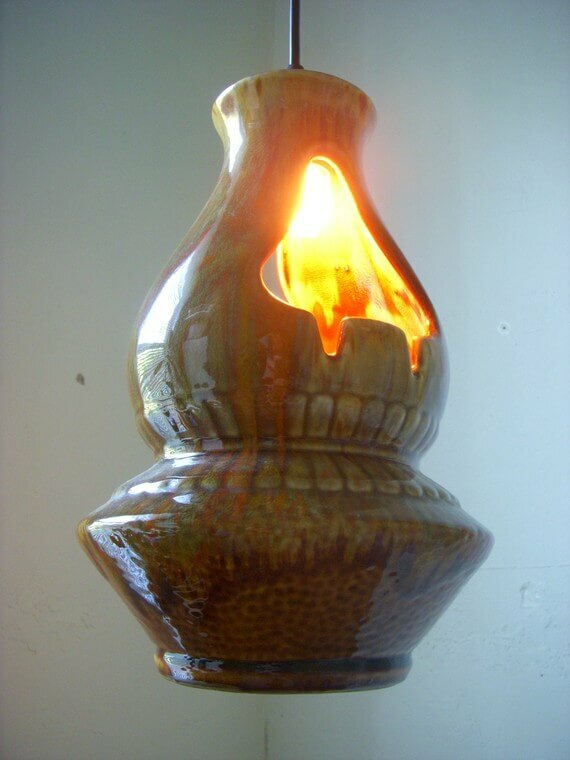 Readers, also note: Please also take care not to overload the wattage of any pendant lighting — depending on where you buy an upcycled pendant light from, you might want to have it doublechecked with a local lighting expert to make sure of its wiring and that you are not overloading it. Pretty pretty pretty. Different vases and such, matched with vintage receptors or caps or whatever you call the things that hold them— love the mashup! Each of these is $48 from BootsnGus. More pretty pendant lights — grouped, $100 — from BootsnGus. BnG, who is based in Ypsilanti, Michigan, sure is workin’ this concept! $100. BootsNGus pendant light made from ceramic planter. 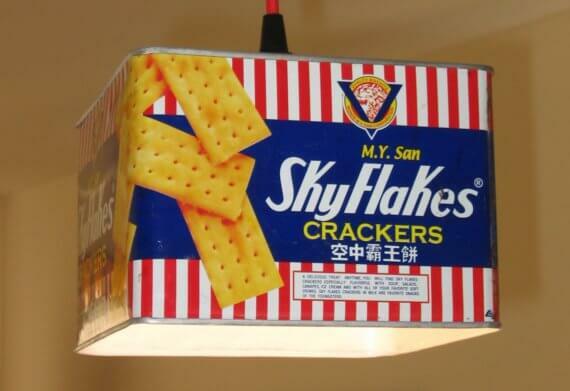 Pendant light made from cracker tins, several styles available, $55 from metalight on etsy.com. 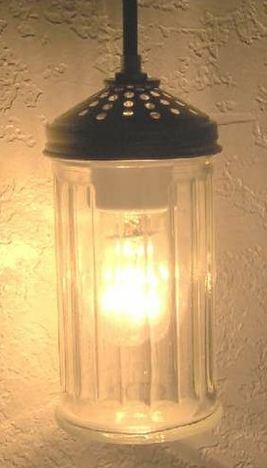 Pendant light made from oil funnel, $68.95 from PaddyRidge on etsy.com. Pendant light from pizza shaker, $35 from WashburnArt, etsy. Pendants made from vintage teacups, $48 each, from TheSalvagedTeaParty, etsy. Back to fancy artists with their own websites. 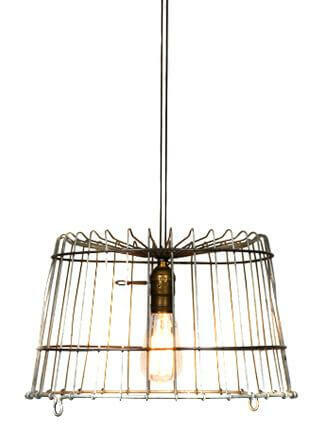 Pendant light made from a vintage egg basket. Drats, I sold a vintage egg basket at my garage sale last summer. What was I thinking? NEVER let anything leave the house! Hoard everything vintage, don’t let those neat-freaks dissuade you! $125 from Junkyard Lighting. Same idea, same company as above, currently sold out. Haha, I am pretty sure I still have my metal basket that looks like this. They will pry it from my cold, dead hands. 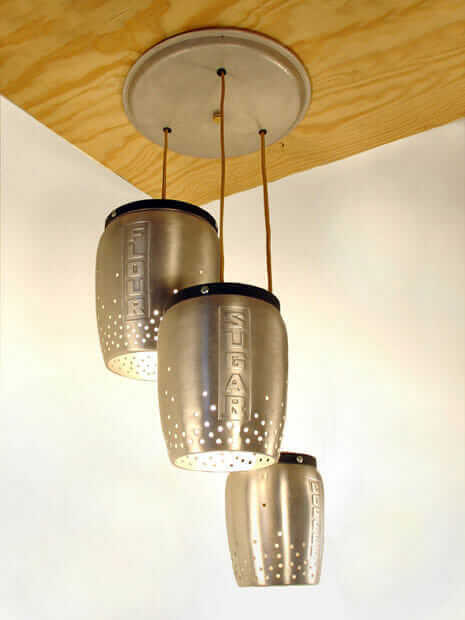 Adorable beyond adorable: Pendant lights upcycled from vintage kitchen canisters by Rodney Allen Trice / The Other Man’s Treasures. First spotted on Simply Stated. Died and gone to heaven. That Rodney Allen Trice is a genius. This pendant made out of a vintage Christma tree holder is just the best. It looks from the website like all work is custom. 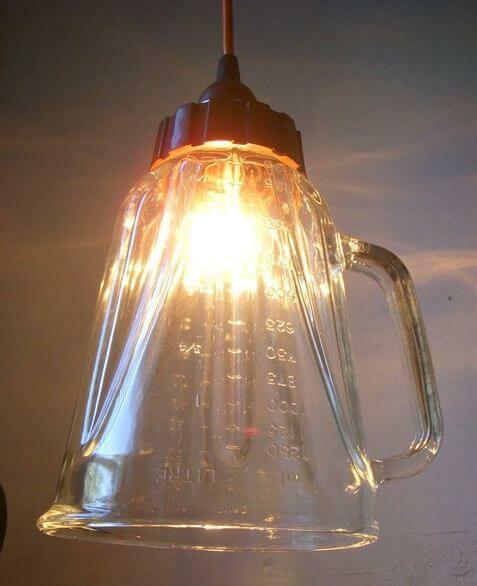 Here’s a beauty: 1930s selzer bottles turned into pendants. $295 on sale from Russell Johnson Imports. Spotted on CasaSugar. 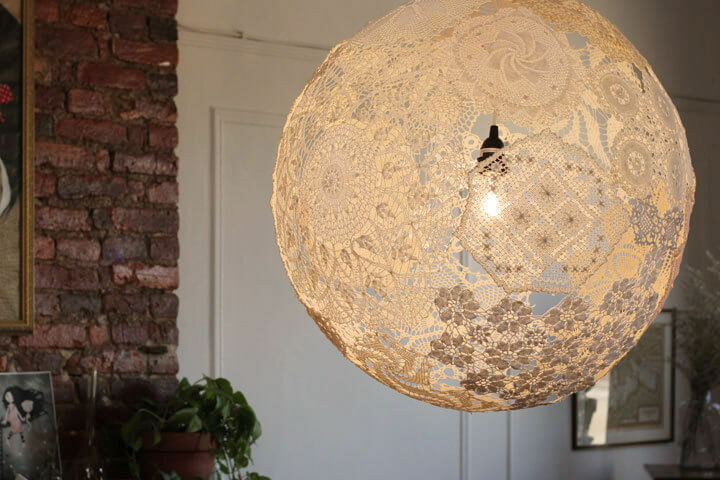 Ooooh, I love this, too: Vintage doilies sewn together to create a pendant light, $850 by ReMadeUSA by Shannon South. 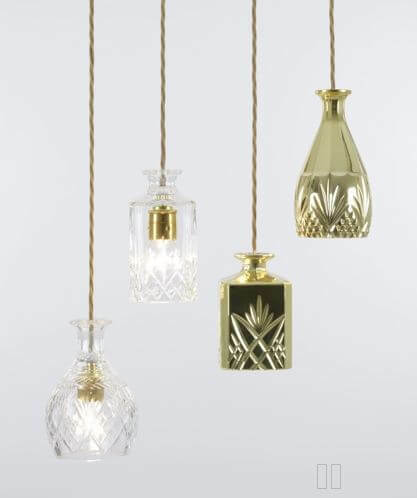 Now these are pretty fantastic: Lead crystal decanters turned into pendant lights. They are by Lee Broom, I can’t see a price. Update: A commenter said $230. Phew. This one took me hourz. 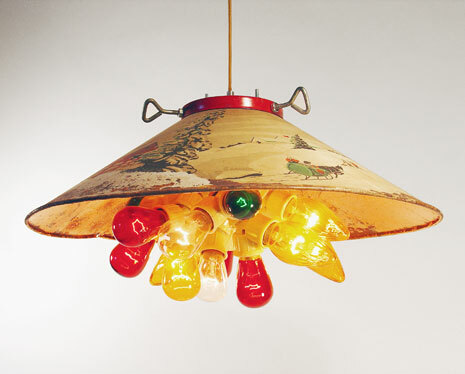 Just as I did with my megapost last week, on — 19 mid century and modern sofas — I am looking to build the definitive list of pendant lights upcycled from vintage treasures. If you spot any more artisans or retailers, will you let me know? Put a bulb on it! 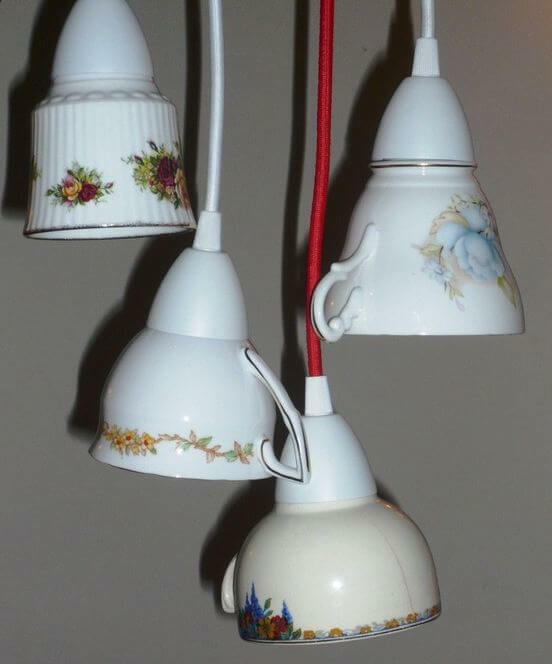 Were you so inspired by yesterday’s story about 24 pendant lights upcycled from vintage finds that you now want to try your hand at making one of your own? 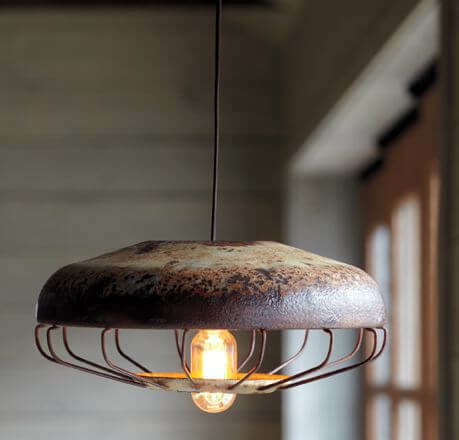 Well, I’ve found us and expert — lighting designer Susan Schneider of Shandells.com — who gives us tips on how to select vintage vessels that repurpose well into pendant lighting. We had so much fun making this video. Yes, it’s 14 minutes long, but it really goes fast because we are such goofballs. 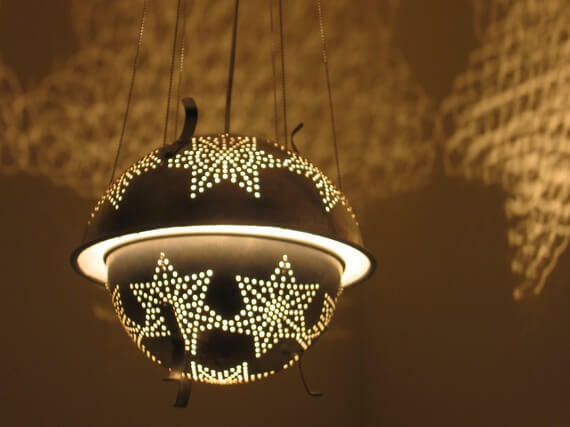 Want to DIY a pendant light of your own? See Susan’s cloth cord lighting kit here. We’ve just completed new construction. I bought galvanized buckets for the canopy portion of pendant lighting. Why buckets? Our house is built over an old well original to the community from the 1820’s. I use buckets throughout the house representing the old well bucket. The bucket canopies are a real conversation piece! 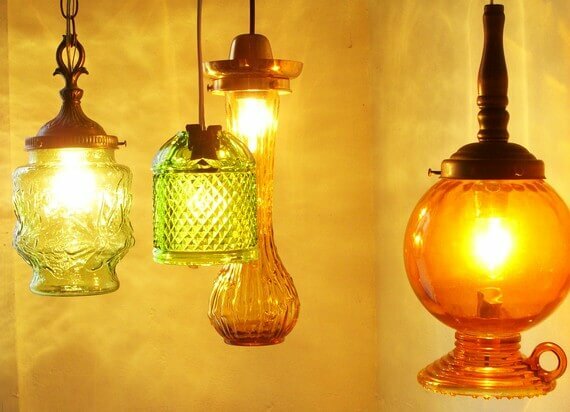 Where do you buy your cords and sockets to make these pendants lights. Love your creativity! Note, affiliate link – I earn a wee commission if ya click and buy.